Rajasthan is famous for the majestic forts, intricately carved temples and decorated havelis, which were built by Rajput kings in previous ages, they were the soul of pre-Muslim era Rajasthan. Jantar Mantar, Dilwara Temples, Chittorgarh Fort, Lake Palace, City Palaces, Jaisalmer Havelis are part of the true architectural heritage of India. Jaipur, the Pink City, is noted for the ancient houses made of a type of sand stone dominated by a pink hue. At Ajmer, the white marble Bara-dari on the Anasagar lake is exquisite. Jain Temples dot Rajasthan from north to south and east to west. Dilwara Temples of Mount Abu, Ranakpur Temple dedicated to Lord Adinath near Udaipur, Jain temples in the fort complexes of Chittor, Jaisalmer and Kumbhalgarh, Lodarva Jain temples, Bhandasar Temple of Bikaner etc. The Jain temple of Ranakpur.Endowed with natural beauty and a great history, tourism is a flourishing industry in Rajasthan. The palaces of Jaipur, lakes of Udaipur, and desert forts of Jodhpur, Bikaner & Jaisalmer are among the most preferred destination of many tourists, Indian and foreign. Tourism accounts for eight percent of the state's domestic product. Many old and neglected palaces and forts have been converted into heritage hotels. Tourism has increased employment in the hospitality sector. Rajasthan is often called a shopper's paradise. Rajasthan is famous for textiles, semi-precious stones and handicrafts. The attractive designs of jewellery and clothes are eye-catching and invite shoppers. Rajasthani furniture has intricate carvings and bright colours. Rajasthani handicrafts are in demand due to the intricate work on them. Above all, Rajasthan's shopping appeals to both tourists and people from other parts of India due to its cheap prices for quality goods. A decorated Indian elephant during a fair in Jaipur, IndiaRajasthan is culturally rich and has artistic and cultural traditions which reflect the ancient Indian way of life. There is rich and varied folk culture from villages which is often depicted symbolic of the state. Highly cultivated classical music and dance with its own distinct style is part of the cultural tradition of Rajasthan. The music is uncomplicated and songs depict day-to-day relationships and chores, more often focused around fetching water from wells or ponds. The Ghoomar dance from Udaipur and Kalbeliya dance of Jaisalmer have gained international recognition. Folk music is a vital part of Rajasthani culture. Kathputali, Bhopa, Chang, Teratali, Ghindar, Kachchhighori, Tejaji etc. are the examples of the traditional Rajasthani culture. Folk songs are commonly ballads which relate heroic deeds and love stories; and religious or devotional songs known as bhajans and banis (often accompanied by musical instruments like dholak, sitar, sarangi etc.) are also sung. Rajasthan is known for its traditional , colorful art. The block prints, tie and dye prints, Bagaru prints, Sanganer prints, Zari embroidery are major export products from Rajasthan. Handicraft items like wooden furniture and handicrafts, carpets, blue pottery are some of the things commonly found here. Rajasthan is a shoppers' paradise, with beautiful goods found at low prices. Reflecting the colorful Rajasthani culture, Rajasthani clothes have a lot of mirror-work and embroidery. A Rajasthani traditional dress for females comprises an ankle length skirt and a short top, also known as a lehenga or a chaniya choli. A piece of cloth is used to cover the head, both for protection from heat and maintenance of modesty. Rajasthani dresses are usually designed in bright colours like blue, yellow and orange. The main religious festivals are Eid Deepawali, Holi, Gangaur, Teej, Gogaji, Makar Sankranti and Janmashtami, as the main religion is Hinduism. 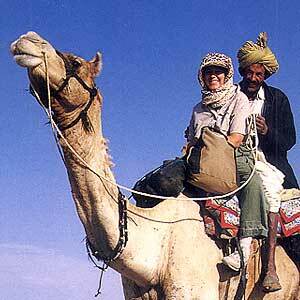 Rajasthan's desert festival is celebrated with great zest and zeal. This festival is held once a year during winters. Dressed in brilliantly hued costumes, the people of the desert dance and sing haunting ballads of valor, romance and tragedy. There are fairs with snake charmers, puppeteers, acrobats and folk performers. Camels, of course, play a stellar role in this festival. The northwestern portion of Rajasthan is generally sandy and dry. 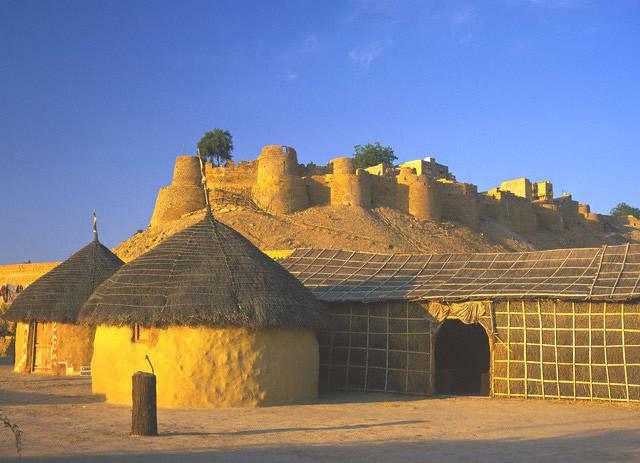 Most of the region is covered by the Thar Desert, which extends into adjoining portions of Pakistan. The Aravalli Range does not intercept the moisture-giving southwest monsoon winds off the Arabian Sea,as it lies in a direction parallel to that of the coming monsoon winds, leaving the northwestern region in a rain shadow. 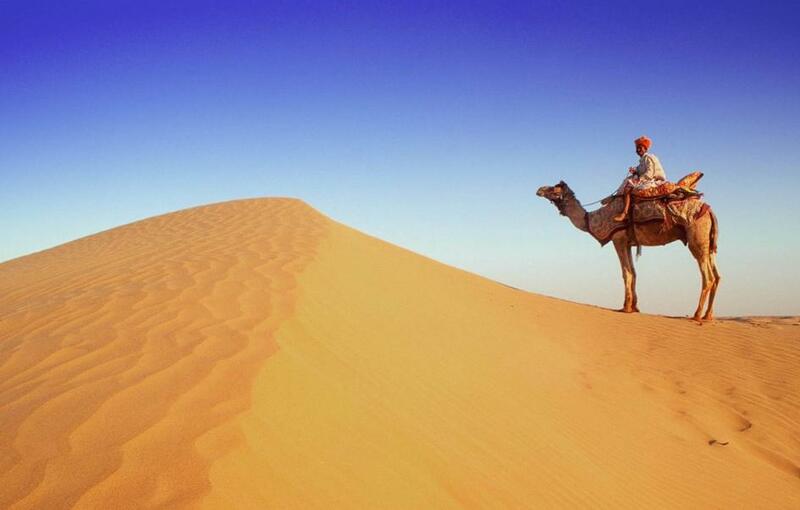 The Thar Desert is thinly populated; the town of Bikaner is the largest city in the desert. The Northwestern thorn scrub forests lie in a band around the Thar Desert, between the desert and the Aravallis. This region receives less than 400 mm of rain in an average year. Summer temperatures can exceed 45 °C in the summer months and drop below freezing in the winter. The Godwar, Marwar, and Shekhawati regions lie in the thorn scrub forest zone, along with the city of Jodhpur. The Luni River and its tributaries are the major river system of Godwar and Marwar regions, draining the western slopes of the Aravallis and emptying southwest into the great Rann of Kutch wetland in neighboring Gujarat. This river is saline in the lower reaches and remains potable only up to Balotara in Barmer district. The Ghaggar River, which originates in Haryana, is an intermittent stream that disappears into the sands of the Thar Desert in the northern corner of the state and is seen as a remnant of the primitive Saraswati river. The Aravalli Range adds diversity to the landscape of Rajasthan. The hills around Jaipur.The main geographic features of Rajasthan are the Thar Desert and the Aravalli Range, which runs through the state from southwest to northeast, almost from one end to the other, for more than 850 km. Mount Abu is at the southwestern end of the range, separated from the main ranges by the West Banas River, although a series of broken ridges continues into Haryana in the direction of Delhi where it can be seen as outcrops in the form of the Raisina Hill and the ridges farther north. About three-fifths of Rajasthan lies northwest of the Aravallis, leaving two-fifths on the east and south. The Aravalli Range and the lands to the east and southeast of the range are generally more fertile and better watered. This region is home to the Kathiarbar-Gir dry deciduous forests ecoregion, with tropical dry broadleaf forests that include teak, Acacia, and other trees. The hilly Vagad region lies in southernmost Rajasthan, on the border with Gujarat. With the exception of Mount Abu, Vagad is the wettest region in Rajasthan, and the most heavily forested. North of Vagad lies the Mewar region, home to the cities of Udaipur and Chittaurgarh. The Hadoti region lies to the southeast, on the border with Madhya Pradesh. North of Hadoti and Mewar is the Dhundhar region, home to the state capital of Jaipur. Mewat, the easternmost region of Rajasthan, borders Haryana and Uttar Pradesh. Eastern and southeastern Rajasthan is drained by the Banas and Chambal rivers, tributaries of the Ganges.